Before I discuss sleep apnea pillows, let me ask you this question: What do the following have in common: Snoring, insomnia, poor blood circulation, acid reflux, lower back pain, sleep apnea, and whiplash? Yes, they are all serious medical conditions. But one thing all these medical ailments have in common is that their symptoms can be alleviated (at least partially) through the use of proper pillows. Pillows that help with medical conditions are often called orthopedic or therapeutic pillows – and more people are using them today than ever before. One very important type of therapeutic pillow is a sleep apnea pillow, which is designed to help those who suffer from sleep apnea. Sleep apnea is one of many sleep disorders that afflicts millions of people today. A person suffering from sleep apnea will repeatedly stop breathing while they sleep. This can cause a person to repeatedly wake up during the night, depriving them of needed rest. There can be a number of causes of sleep apnea, one of which occurs when the airways become blocked, perhaps due to pressure from the body. Sleep apnea is a serious medical condition: Stroke is associated with it, in some cases, and those afflicted with sleep apnea have upwards of as much as a 30% higher risk of heart attack – even death! And this is where a sleep apnea pillow can be useful. Medical studies have confirmed that sleep apneas are worse when a person sleeps on their back – sleep apnea pillows are specially designed to help keep the airways open during the night when you are asleep. It is particularly important to make sure that the neck, and neck muscles are positioned properly, and sleep apnea pillows will help you to do just that. One innovative design in sleep apnea pillows is something that looks like a fishhook or the letter “U” with one of the sides cut down a little bit. 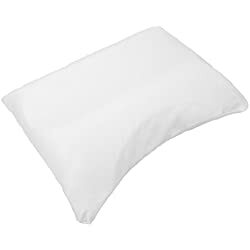 With this type of sleep apnea pillow – called the Sleep Posture pillow – one rests on their side, rather than on their stomach or back. In fact, with the Sleep Posture sleep apnea pillow, it would be pretty hard to sleep on anything except your side. Your head rests on the curve, the longer side extending along your back, the shorter side will provide a place for your arms to hold. With this sleep apnea pillow, even your ears will get rested, as the designer has cut out a hole for your ear lobe to rest in as you lay on it. No more bent ears! Another type of sleep apnea pillow is called the Side Sleeper Delight. It too is designed to encourage the sleeper to sleep on their side. 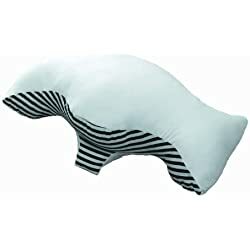 To keep the sleeper from turning on to their back during the night, this sleep apnea pillow has molded areas for the head/neck area to fit in, yet rest comfortably. 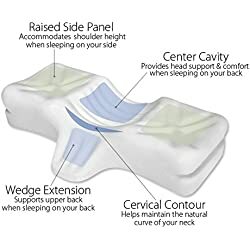 This type of sleep apnea pillow is also made in a wedge shape, which gently lifts the upper body, raising it above the level of the feet and legs. This sleep apnea pillow will also help to alleviate snoring, and people who suffer from sleep apnea oftentimes have snoring problems as well. If you suffer from sleep apnea, check with your medical professional. If they recommend it, a sleep apnea pillow can help you achieve that total body restfulness that you have been missing for many years.